Aqua Legion UK Ltd provide independent cooling tower risk assessments to a number of organisation throughout the UK. Samples can be collected and tested for Legionella, chemical or microbial parameters as part of the cooling tower risk assessment or independent cooling tower inspection. Our Cooling tower risk assessment, cooling tower inspection and testing services are designed to offer the responsible persons a level of reassurance and confidence the that tower is operating is a suitably safe and cost effective manner independent of the water treatment contractor. The HSE’s ACOP L8 Guidance Document details the requirement for routine legionella testing of cooling tower waters. Water samples should be collected from the cooling tower and tested for legionella on a quarterly basis. A new cooling tower system should be tested monthly or until it can be proven that the system is under control. The back bone of good cooling tower management is a good cooling tower risk assessment. In addition to Legionella testing and sampling, cooling towers should be tested for aerobic bacteria on a weekly basis using dipslides and at least quarterly by a UKAS accredited laboratory. Chemical testing of the cooling tower make up water and system water should be conducted to cover the weekly, monthly and quarterly tasks as recommended in the HSE’s ACOP L8 guidance document. We can conduct cooling tower sampling on an adhoc reassurance basis, routinely or as part of the cooling tower risk assessment. If you are responsible for a cooling tower and require an independent cooling tower risk assessment or review of the tower or control regime you have come to the right place and Aqua Legion look forward to hearing from you. If you require a cooling tower risk assessment or cooling tower inspection service you have come to the right place. Whilst we can conduct a series of cooling tower testing and monitoring services and can facilitate disinfections, refurbishments and maintenance, we do not provide such remedial works directly. Our key role in Cooling Tower Management and the cooling tower risk assessment and control regime is extremely clear. Aqua Legion UK Ltd specialise in independent cooling tower risk assessment. We aim to provide specialist independent support and competent advice to responsible persons and duty holders directly relation to the Cooling Tower Management programme or cooling tower risk assessment. Our service is designed to offer direct support and protection to the Duty Holders and those appointed as the Responsible Persons for the operation of the system cooling tower system. If precautions are to remain effective, the condition and performance of the system will need to be monitored. This should be the responsibility of the Responsible Person or where appropriate, an external contractor or independent third party! That’s us! Our service is specifically targeted towards supporting the Duty Holders and Responsible Persons in achieving compliance to the HSE’s ACOP L8 requirements. It is clear that in order to achieve compliance to L8 in this area, that an Independent specialist is the most sensible way to go. Ask yourself, it is right that the water treatment company monitors their own work without any independent verification? Does the water treatment company’s monitoring and sampling regime, cover the Responsible Persons requirement to ensure that the control programme is monitored for effectiveness. What direct tasks are undertaken by the named responsible persons and do they include of the above listed. If the responsible persons doesn’t have the above list covered under their duties then it is highly recommended that an independent be appointed to cover the requirements. The truth about Cooling Tower Management – Some say ludicrous but it’s true! It is clear in ACOP L8 that it is not the responsibility of the Water Treatment Company to ensure that the water treatment programme is working effectively. ACOP L8 states, It is the responsibility of the Responsible Persons to ensure the water treatment programme is working effectively, but how does the responsible person do this without undertaking independent sampling, inspection, audits, and monitoring? Aqua Legion UK provide the Responsible Person with a Water tight solution! Our involvement allows the Duty Holders and Responsible Persons to demonstrate a level of due care and diligence in line with The Management of Health and Safety Work Regulations through the provision and access of specialist support. The importance of this cannot be emphasised enough, particularly when we are talking about cooling tower risk assessments, cooling tower inspections and cooling testing and cooling tower monitoring regimes which are the direct responsibility of the Responsible Persons even when the work is delegated to a contractor. We can’t emphasise enough, if the Responsible Person is to be truly covered, then they will need to ensure all of the items listed above are covered personally or through the use of an independent third party as stated in ACOP L8. By maintaining a level of independence from the day to day cooling tower water treatment and management programme, Aqua Legion is able to offer this impartial service to Duty holders, Managers and Responsible Persons. Impartiality can also bring cost savings! The importance of impartiality can be further highlighted when looking at the chemical and water consumption of a cooling tower. Far too often we have reviewed cooling tower water treatment programmes and found the cooling tower to be operating at 1 or less cycles of concentration. Do you know how many cycles of concentration your cooling tower is running at? Do you know what we mean when we highlight this issue? Well lets explain this very important issue which is far too often forgotten about or brushed under the carpet. Cooling Tower Cycles of Concentration explained. What’s your system doing? In simple terms, cooling towers are typically supplied with treated softened water, they are then dosed with a primary and secondary biocide to control microbial activity, biofilm formation, corrosion and scaling. The water in the tower should then be circulated a number of times (Cycles of Concentration) before its conductivity increases to a set level and the water is then dumped or bled via automatic solenoid valve. Once bled, fresh water is then introduced to the tower and so the cycle continues. If the conductivity level is set too low, the solenoid valve will open too frequently and the tower will dump or bleed off its water and reintroduce fresh water continuously. Every time water is dumped fresh water is introduced and more chemical will be required. The more chemical required the better it is for the water treatment contractor and the more expensive the tower is to run chemically and water consumption wise. Consequently, it is vital from a cost point of view that the cooling tower and conductivity meter is set to allow the tower to run at least 3 cycles of concentration. Any less than this should be considered suspicious and therefore justified by the treatment contractor. If the cooling tower is supplied with softened water and a side stream filter, it is not normally necessary to run the tower at less than 3 or 4 cycles. The optimum cycles of concentration for cooling towers with a softened make up and filter is around 6 cycles. Whilst we agree that the lower the cycles of concentration the less likely a tower is to suffer from fouling, we are also aware that towers served with softened water and side stream filters are unlikely to suffer significantly more fouling at between 4 and 6 cycles in comparison to 1. As such too many towers are run at low cycles simple to increase chemical consumption and the sad thing is, the responsible persons are often completely unaware. Sorry folks had to let this one out the bag! The security and savings an independent specialist can provide to the responsible persons should not be underestimated. So if you would like an independent look at how many cycles your tower is operating at contact us now. Cooling tower risk assessment and routine monitoring. We are able to conduct the routine monthly quarterly and six monthly sampling and inspection programmes to cover the cooling towers. Onsite Personnel can be provided with training to undertake the daily and weekly checks required. The independent routine programme will be to ensure the water treatment contractors are doing an effective job and that the control programme is working cost effectively. By conducting regular independent audits of site records and services, we can report direct to the responsible persons with any key issues to be addressed in an organised and priority based manner through the provision of a water sampling or audit report. Cooling towers can be dangerous. Are you the named responsible person or duty holder? Do you need an organisation fully focused in supporting you with the compliance and legal obligations associated with operation of your cooling tower? Do you need confidence in the current water treatment programme or company maintaining the cooling tower. Would you like to know if you could save money on water consumption or chemicals. Contact Aqua Legion Now! Every cooling tower should be subject to a water management control regime in line with the cooling tower risk assessment. Typical routine testing monitoring and management tasks will be standard for all cooling towers. However, particular towers and systems will warrant particular tasks. Such tasks will be defined in the site specific cooling tower risk assessment. However, to offer something for reference an example of the minimum cooling tower monitoring requirements are detailed below. 3) Dipslide test to cooling tower system water. 6) Water Treatment Contractor, service visit to check dosage equipment, top up chemical dosage tanks, and, undertake site water system tests as necessary. 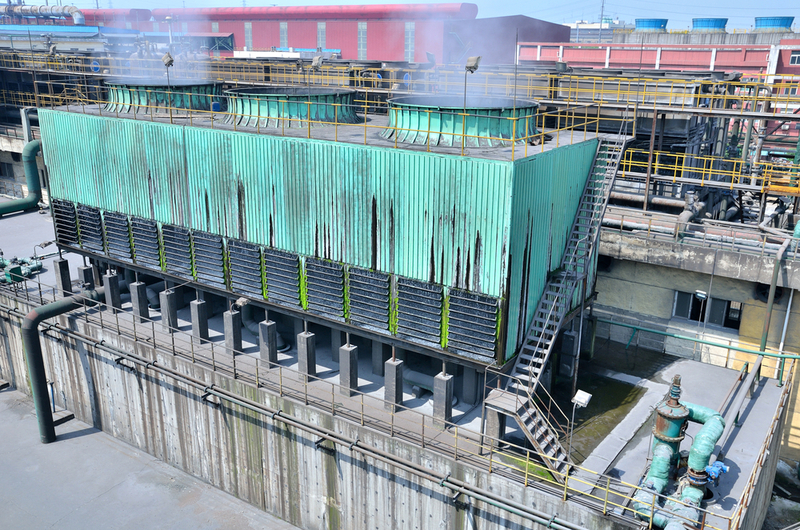 13) Clean and chlorination of cooling towers. Remember if you need a specialist then your in the right place and we look forward to hearing from you.